Sabrina Freeman, Ph.D. (1958-) was born in Montreal, Quebec, and grew up in Vancouver, British Columbia. She graduated from Stanford University in 1995 with a Ph.D. in Sociology, specializing in small group research and the study of organizations. Upon her return to British Columbia, Freeman spent 14 years advocating for the rights of children with autism to be included in the government funded health care system for their core health need -- autism treatment. During this period, so many parents were desperate to access treatment programs that Freeman created a 35 minute VHS/DVD [Autism: Now What Do I Do?] 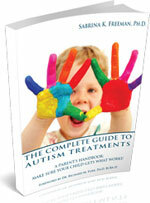 to help guide parents through setting up science-based treatment programs for their children. In 2002, she was awarded Queen Elizabeth's 50th Golden Jubilee Medal for advocacy work done on behalf of children afflicted with autism. Freeman's advocacy culminated in the now famous Supreme Court of Canada ruling Auton (Guardian ad litem of) v. British Columbia in 2004. The landmark legal effort was organized by Dr. Freeman in an effort to include medically necessary autism treatment in Canada’s universal health care system. During the last 15 years, Freeman wrote several books on autism, one of which [Teach Me Language] has been subsequently translated into French, Italian and Norwegian. The next book she wrote, [Science for Sale in the Autism Wars], chronicles the struggle children with autism face against a system that does not recognize their rights to treatment. Her most recent book [The Complete Guide to Autism Treatments (2011)] is an up-to-date evaluation on the various treatments offered for children with autism. Her hope is that through her scholarship, thousands of parents will not have to go through the uncertain journey of generations of parents of newly diagnosed children. Instead, she offers parents a way to quickly evaluate various treatments and make sure that their child receives science-based treatment rather than treatments based on testimonials and good wishes. Dr. Freeman lives in the United States with her family, including a daughter with autism. Now we have much more knowledge about autism; however, the quackery has grown exponentially and it is very difficult for the new parent to navigate the waters of autism treatment. My goal is to educate parents of children with autism. This is an extension of my efforts through the books, DVD and advocacy with which I have been involved since 1995. Unfortunately, due to the huge amount of information and misinformation on the internet, science is drowned out by seemingly very appealing choices for treatment, most of which have no science supporting the various treatment claims. It is also a goal of this blog to counter this trend. My mission is to blog truthfully, and often, with no regard to political correctness. If it has to be said, it will appear in the pages of this blog. We parents of children with autism have been given a huge responsibility and I have learned much in the past 20 years. Through this blog, I will share what I have learned. Hopefully, my experience will make your journey more efficient and less painful, and, ultimately, your child will benefit. This is why I included a section on Lifestyle Issues. I’ve grappled with these issues and conquered many of them. I am convinced that as partners, parents and a small number of true professionals, we can innovate our way out of many of the challenges that autism throws in our path. Sabrina Freeman speaks with Kevin Dewalt, in an interview about Why Objective Science is Critical for Identifying Evidence-based Treatments (approximately 45 minutes courtesy of the Puzzle Ribbon Project).